A busy week for Kingdom Hearts news! 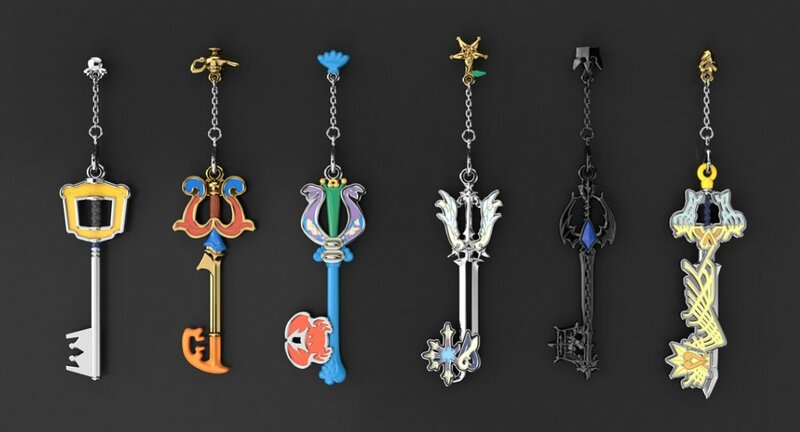 We now know that Bandai's going to release a line of Kingdom Hearts Keyblade keychains featuring Keys from the first game! This list includes the Kingdom Key, Three Wishes, the Crabclaw, Oathkeeper, Oblivion, and the Ultima Weapon! The keychains also come with ramune soda candy! You can pre-order the keychains individually for $8 USD, in blind packs for $6 USD, or the entire set for $35 USD from our friends at Aitai Kuji! No release date news yet but we'll keep you posted! I love that Crabclaw is getting some attention! I really like these! Yeah I think they're made out of enamel and they may have a metal base. They almost look like Disney trading pins, which are made out of the same material. I'm definitely digging Ultima or Oblivion the most. The guard around the hilt on Ultima is the wrong color though. I love the oathkeeper and oblivion ones, but I also agree that it's nice that the underrated keyblades are getting attention.